Music by gamers for gamers. 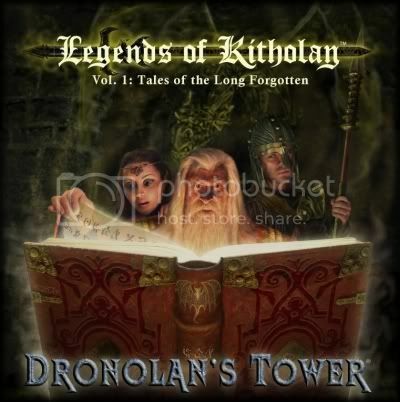 Dronolan’s Tower is the one man project of David Allen Young. His ideas for the soundtrack stile music did not sound as he wanted when making the music by himself so he hired an orchestra and a choir in Hollywood to do it for him. The result is medieval fantasy mood music with more hints of darkness than light. If you like bands like Erdenstern you will probably drool while listening to Dronolan’s Tower. When I saw the artwork I thought of Midnight Syndicate but oh so wrong I was. This is far beyond what Midnight Syndicate could even dream of! It’s actually in the same league as the more experienced top dogs in this genre. "The Battle of Shadow pass" is without a doubt the best track on the CD and I love it. I have almost nothing bad to say about this great release. I though would like to hear something a bit more unique from time to time. David list (on his myspace site) John Williams, Jerry Goldsmith, Danny Elfman, Hans Zimmer, Basil Poledouris (and others) as influences and you can hear that in the music. Some might say too much. To be honest this is a very good and ambitious project which I cannot other than applaud!